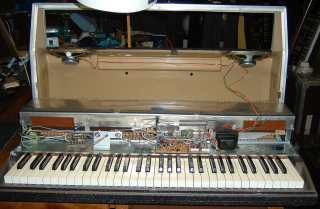 I have serviced Wurlitzer electric pianos since the late 'sixties, the days of the 'wooden box' models. By the ' seventies the updated EP200(A) versions were selling like 'hot cakes'. Taking over from the Hammond organ as the de rigueur group keyboard. At the time of the 200A, Bill Dunne and I provided official guarantee repairs, tuning etc. for the major distributer & retailer (called Bargain Basement, who were based in Kingston). Many dealers complained to Wurlitzer that this company was undercutting them, asking that supplies to them be stopped. Wurlitzer's reply was that it was not possible, Bargain Basement sold more pianos than all other shops put together. A restored EP200A, at our Mercia workshops. 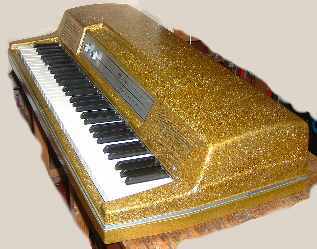 The Wurlitzer Electric Piano evolved over a number of years. It has a fully featured single escapement action, similiar in principle to an early grand piano's, although smaller & lighter. Its tone source is a set of 64 tuned steel reeds, struck by graduated felt dressed (teardrop) hammers. Reeds' vibrations are electrostatically picked up, by electrodes biased with a DC Voltage. The movements cause a capacitance change, modulating this bias. The resultant AC signal is amplified & fed to speakers. The EP200A model shown above represents the culmination of the evolutionary process. Sold in large numbers, it remained in production for a number of years. Eventually sampled digital pianos advanced enough for their lower cost to take over the market. All electro-Mechanical instruments eventually fell prey to the digital revolution, fuelled by pure marketing pressures. It is only in recent years that many musicians & music lovers have realised what has been lost. Fortunately the superior quality & reliability of mechanical instruments means that many remain working. Despite often being stored in unsuitable conditions, such as damp garages, sheds or basements. Electronic classics, such as the Prophet Five, rarely survive such treatment. The 100 series are housed in rectangular wooden cases, with detachable lid to protect keys. Earlier models, such as the 111, have valve amplifiers & are mechanically different. Thinner reeds than on later types, mounted the opposite way on a slender steel harp. Most later 100 series models, such as the 140B, use transistor electronics & are mechanically similiar to the 200 series. Reeds are mounted on a pair of cast aluminium harps and are of thicker gauge. Performance models, apart from the first valve versions, include tremolo, strangely misnamed vibrato. The 200 series employ an updated case design, a curved vinyl top cover, available in several colours & with keys permanently exposed. The 200A pictured at the top is typical of the portable types. A number of variants cater for different uses, such as student & tutor models for school use. Also a butterfly grand style. All use the same mechanical design, with suitable electronic variations. The 200A series is the last major variation on the theme. 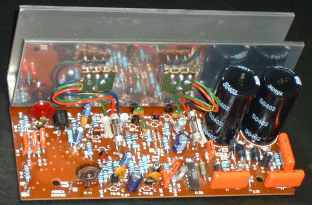 Electronics are improved, with the harp mounted pickup pre-amplifier separated from the power amplifier. Background noise is lower & an additional shield over the pickups reduces hum. Tremolo is smoother, with less distortion. The cover on these is always black, with the speakers usually mounted directly, for improved bass. The 300 was the last model produced & is rare in Britain. It has a wooden console cabinet, with a 1930s look to the styling, a hinged lid covers the keys. Keyboard, action & electronics are pure EP200. Probably the best sounding model, due to larger speaker and a full sized cabinet. The Wurlitzer EP series is quite unlike the Rhodes piano in action & timbre. As well as being much lighter. Popular for rock music, due to its stronger, sharper sound. The action is light, fast & responsive. Dynamic range is good, although to get a hard angry sound, often desired for rock music, requires heavy playing. This dramatically shortens the life of reeds. Good quality replacements are difficult to obtain & thus expensive. Although the action is light and fairly fast, the single escapement means that it will not respond to fast 'trills'. Each key must fully return to its rest position, before the jack will latch under the hammer, ready for another strike. Origin: Benjamin Miessner, an inventor, designed a pickup system for an upright string piano in the 1930s. Blown reeds were later added for a fuller sound, the design was then sold to the Everett Piano Company. In their hands the idea became an electric reed organ, rather than a piano as originally intended. The Wurlitzer company, of theatre organ & jukebox fame, then took over development. They designed a reduced size grand piano mechanism to strike the reeds, the Wurlitzer Electric Piano was born. According to Wikipedia the first production piano was introduced in 1955, the model EP112. I however own a production model EP111, which was actually introduced a year earlier, in 1954. This uses a reversed version of the basic geometry & has a narrow steel strip in place of a harp. It is a pretty instrument, with an integral ornate steel music rest. Its pedal floor plate folds for convenient storage. When I have time to restore it, photographs will be placed here. Rogues Gallery, # 2, the Yellow Peril. This instrument was supposedly restoredl. It came to us because it did not work well, with a weak, dull, lifeless sound & out of tune. It has very loose keys, bushings are badly worn. Most reeds were loose & dull sounding. The person who "tuned" it had tried to get it in pitch by adjusting the reed screw tension. After tightening reeds, most are sharp, requiring re-weighting, one has NO weight, only making a faint ping. Many have no sustain, needs a new set. Some pickups had been bent with pliers, requiring a strip-down, beating flat & reprofiling. The amplifier has poor sound, low level & a bit distorted. Needs a good service & some new parts. Speakers have poor treble, the cones have become soft & fluffy with age. Sounds like a typical neglected 200 series piano, you may say. True, but the owner had paid for a full restoration. The first thing we noticed was its bright colour, the battered vinyl cover had been paint sprayed! It has a replica control panel, a pity it was not fixed on properly, only held by the non-original 'hi-fi' knobs. These are loose & prone to fall off. Non countersunk leg plates are held by countersunk screws. The rule of thumb is "Buyer Beware". This piano has not been restored, not even properly serviced. A quick lick with a paint spray is not what these instruments need. The keys may be too far gone to be re-bushed, this can happen through bad storage conditions. It may not even be useful for spares, almost everything is worn or damaged. Even the leg plate screws are wrong, wrecking any finish it is placed on. It is possible to buy Wurlitzer pianos that have been looked after & in reasonable condition. Check thoroughly before purchase, make sure it plays well, that you like the feel & sound. The action should be fast & smooth. No loose or bouncy keys. Sound should be fairly bright & reasonably even. If it needs a tune, only take it to someone who genuinely knows how to do the job. With the renaissance of these classics, many ex TV repairers etc. are coming out of the woodwork & jumping on the service / restoration bandwagon. Some know how to get an impressive Web site together, it's the substance that counts though. There are some good people in our business, we think this includes us. We have dedicated a working lifetime to what we do, so please don't tar us all with the same brush. We enjoy our work, it is rewarding when a player smiles after trying the finished job. We will never get rich, one pair of hands can only do so much work properly. If you must have a customised finish, this is the way to do it. The digital photo does not do justice to its brilliant gold glitter. Done by someone specialising in drum kit re-finishing. We were happy to service this instrument. It is good to see a craftsman's work, after all the 'bodges' we have been asked to resurrect, over the years. It is also quite a good piano & responded well to our ministrations. So well chosen personalising can add a little something, especially if the casework has suffered damage or wear. Originality is not always sacred. On the other hand. Another customised piano. This Wurlitzer was brought from America, as a restored instrument, customised to its new owner's specification. It is a tidy instrument, in a reasonable state of repair. It is however not an EP200A as advertised. It is in fact an EP206 Student model. Taken off its base, fitted with 200A amplifier and replica speakers. An acceptable conversion, but not a restoration. The neat white paint-work is not an ideal colour choice, although not the seller's fault. From any distance it looks whitewashed, the speakers also lack efficiency. We tuned it, converted it to 230 Volts, adjusted the mechanism, rebuilt & uprated the amplifier. It is now quite a reasonable machine, but still white. Wurlitzer EP200A amplifier, re-built in our standard way. Resistors & capacitors replaced with modern high performance parts. Out of specification transistors & diodes replaced. Background noise reduced, heat sink cleaned and polished. Printed circuit dried out & sealed against moisture absorption. Wurlitzer are the oldest in our current listing of classic instrument builders. Incorporated in 1856. It is possible that new Electro-Mechanical instruments will be produced. If we have anything to do with it they will. The temptation must be avoided to simply recreate past classics. Time has moved on, anything built now should be an evolutionary step forward. Designs should capitalise on the genre's strong points, avoiding any temptation to compete on price or cut corners, high quality & long life are needed. Some may remember the Lawrence Piano, an amplified stringed instrument from the 'seventies'. Pressed steel frame, folding plastic keyboard & action. Owing more to a tradition of cheap electronics' construction than 300 years of piano history. Are any still around? Visit pages for more information.